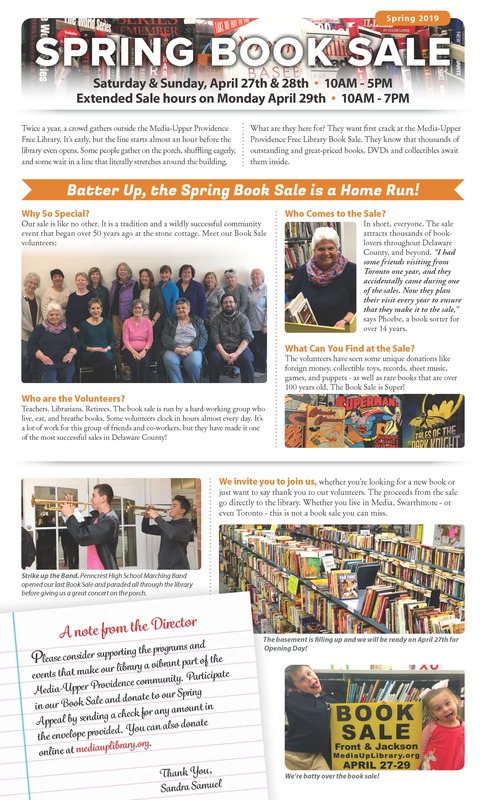 The Spring Book Sale is Almost Here! We are overflowing with Music CDs, Books on CDs, DVDs, Games and Puzzles. SATURDAY – Hardbacks, Trade, DVD/CD, Puzzles/Games: $2.00. Paperbacks & Records: $1.00. Coffee Table, Rare and “Special” Books: as marked. SUNDAY – All Half Price. MONDAY – $5.00 Bag Day. What are the book sale dates? The Book Sale operates bi-annually (twice yearly) on the third weekend in April and October. When do you accept donations? Donations accepted: May 1 – September 30 AND November 1 – March 30. Where do you accept donations? Please leave donations in the bins marked “BOOK DONATIONS HERE” to the left of the main door at the Media-Upper Providence Free Library outside entrance. What types of donations are needed? Where do I obtain a receipt? Receipts are available from the library. Who benefits from the book sales? All proceeds go to the Media-Upper Providence Free Library. Thank you for your support! For more information, follow us on Facebook, Twitter, Instagram, email us at librarysalemupl@gmail.com or call the library at 610-566-1918. 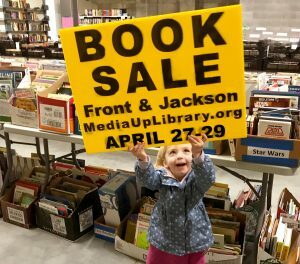 Organized by year-round volunteers to benefit: Media Upper Providence Free Library, Visit us on Facebook, Instagram, and Twitter for Book Sale updates.